sea blue, see green: Oh no! Oh yeah! When I was in college at the University of Maryland, there was at one point a car accident that left a giant hole in the brick wall flanking the main entrance to campus. The University invested in a big sign that showed Testudo (our mascot) busting through the wall that would cover the hole until it could be repaired. 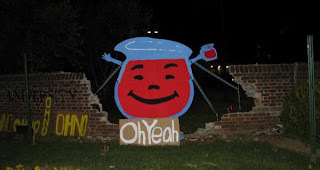 Then one night the expensive sign disappeared and this cardboard Koolaid man was left in its place. It was SO funny at the time (although the University demanded its original sign back which it never received). Yesterday an alumni mailing list was created where I work and this was one of the first photos sent around. It brought back lots of college memories.